It is suitable for automatic double-aluminum foil hot sealing package for tablets, candy and pills in medicine, healthcare, chemical, foodstuff etc industry. Meeting the requirement of sealing for avoiding light, and also it can be used in double plastic hot sealing package. It automatically completes the functions such as vibrating material feeding, broken piece filtering, counting, lengthways and transverse, indentation, cutting waste material, marking batch number etc. It adopts PLC programmable controller, with frequency converter, man-machine interface to operation, and also can adjust cutting speed and trip distance at random. It is accurate feeding, tight sealing, full purpose, stable performance, ease of operation. It can enhance the product grade, extended product durability. 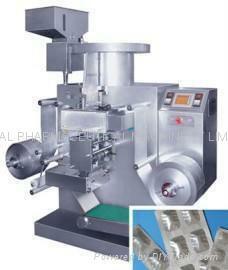 It is ideal equipment for pharmaceutical industry. It has qualified by the national Medicine Inspection of Bureau rank Center, and passed appraisal as the Science and Technology Achievement in Zhejiang Province, and meets GMP standard.